Home /Tips & Tricks / To LLC Or Not To LLC? 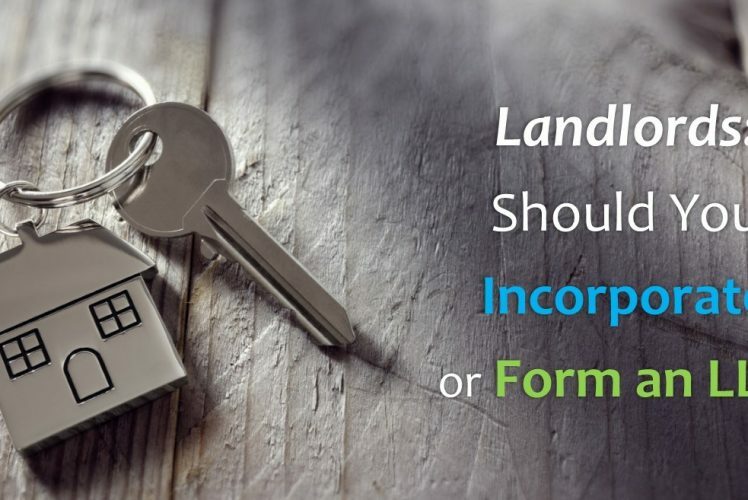 Should You Put Your Rental Properties in an LLC? The answer is- maybe. But maybe not. My upfront disclaimer is that I am not a legal expert of any sort, nor am I a financial or tax expert. I can only tell you, as an owner of rental properties, my experience in researching LLCs as a potential entity structuring method and the results of that research. You should not make any decisions regarding the structuring of your properties without consulting an expert in the field. Whether you should put your properties into an LLC or not depends on your situation and what your goal by doing so is. How many properties do you own, what states are they in, are you just wanting the legal protection from the LLC, would it benefit your financing options, or do you just want to sound cool and say you own a company? I say that last one with all sincerity but in my experience, that last one is a big driver for investors. Maybe it’s not that you necessarily want to seem cool because you own a company but because you just assume that you should create a company to hold your properties. Shoot, I thought that at one time. We hear about it a lot, we hear the gurus talk about asset protection, so we assume we need it. No harm, but let’s get educated first. Why pursue an LLC at all? An LLC can offer both asset protection and tax advantages. Asset Protection. I think this is the big one that drives investors to pursue an LLC. The big liability with a rental property is if a tenant slips and falls and wants to sue you. You know as well as I do, people will sue for anything these days and as soon as someone knows you own properties, you are an immediate target. If you aren’t protected in some way against this, all of your personal assets may be at risk if you are sued. Tax Advantages. Putting your properties in an LLC can offer options of pass-through taxation, avoidance of double-taxation, you can get taxed as a partnership, or if you have the LLC taxed as an S-Corp you may be able to use that to reduce self-employment and other taxes. All of those benefits would have to be tailored to your specific structure and situation, and not all of those options would apply to everyone, but those are some of the things that may be of benefit. Seriously sounding cool. I mean, we all want that, right? Whoa, wait, there are disadvantages? Ha, I didn’t even know that when I first started out. I’d like to also call these disadvantages- “realities”. Cost. This issue will vary depending on where you live and how you do it, but an LLC can really dig into your cash flow. For instance, I live in California so there is absolutely no way I can avoid the $800/year fee that is required for all LLCs to pay. Even if the LLC is a Georgia LLC, for instance, because I live in California there is no way I can avoid it. Another beast of a fee is the cost of filing the separate tax return for the LLC if you use an accountant, which I absolutely recommend if you are dealing with rental properties. For me, that would be another $800-850 per year. Nevermind the fees it cost to set up the LLC in the first place. I don’t recommend using one of those cheap online deals where you do it yourself because one of the biggest financial benefits of rental properties are the tax advantages and if you aren’t set up correctly you’ll miss out on a lot of those. Moral of the story, investors often don’t realize the reality of the impact of entity fees against their bottom line. Financing. Many, if not most, lenders won’t lend to LLCs. Even if they do, it will still be backed by your personal name anyway. In general, getting financing for properties under an LLC name can be very difficult if not impossible. Non-Foolproof Asset Protection. There are situations where an LLC may not protect you from lawsuits. Be sure to understand what those are. Also, if a lawsuit were to happen, sometimes having an LLC can actually complicate the process making it difficult for resolutions to be reached quickly. Triggering Due-on-Sale Clauses. This one only matters if you already own a financed property. Oftentimes investors will buy properties under their personal name and then quit claim it to an LLC. There is no problem in doing that, but there is a slight risk that doing so could trigger the “due-on-sale” clause in your loan agreement meaning you would owe the remainder of the loan immediately. That could be a lot of money to have to come up with out of pocket! I was told it is a small chance it could happen, but a small chance with that much money is worth considering. Consult a licensed professional who specializes in real estate investing to guide you on what you should do. Even if you don’t form the LLC, be sure you have asset protection of some kind. An alternate to forming the LLC in terms of asset protection is getting an umbrella insurance policy. These policies are fairly inexpensive (mine is only $21/month for all my properties) and it gives you the same protection against lawsuits as LLCs will. This is a much cheaper option for the same protection benefit and having that policy will oftentimes make the litigation process easier in case of a suit than having the LLC to go through. My properties are not in an LLC. That doesn’t mean I’ll never have them in one, but for the time being I am not going that route. By the time I ever looked into putting them in one, I already had mortgages on them and risking the due-on-sale trigger was not something I wanted to tempt. Then, adding up the expenses associated with me forming the LLC negated a good chunk of my cash flow that I’m not willing to part with. I instead put them all under the umbrella insurance policy and they are now as secure as if they were in an LLC. I will eventually move all my properties into an entity I’m sure, but that is later down the road when I own quite a few more and have a lot more cash flow margin to work with.